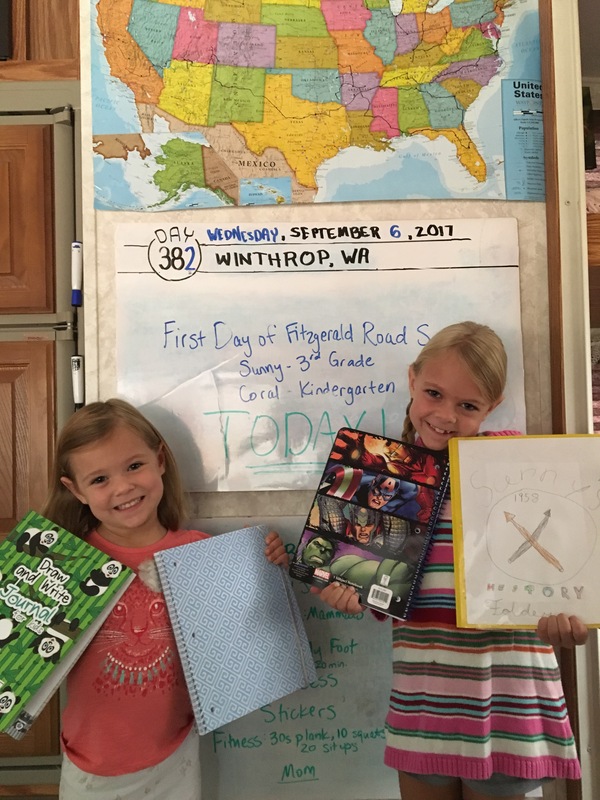 First day of Fitzgerald Road School, Year 2! Kindergarten for Coral and 3rd Grade for Sunny. We have visited the Methow Valley a number of times during our time living in Washington. It’s beautiful and quaint and offers a host of outdoor recreation opportunities. We hoped to have a basecamp in the area for a week or more to see more of area that we’d never had time to explore before – including a plan to drive up into North Cascades National Park. We were hoping to camp near Diablo Lake, which we had always heard was crazy beautiful, but anytime we had ever tried to drive across the North Cascades Highway, it had been closed for one reason or another – usually either snow or mudslides. 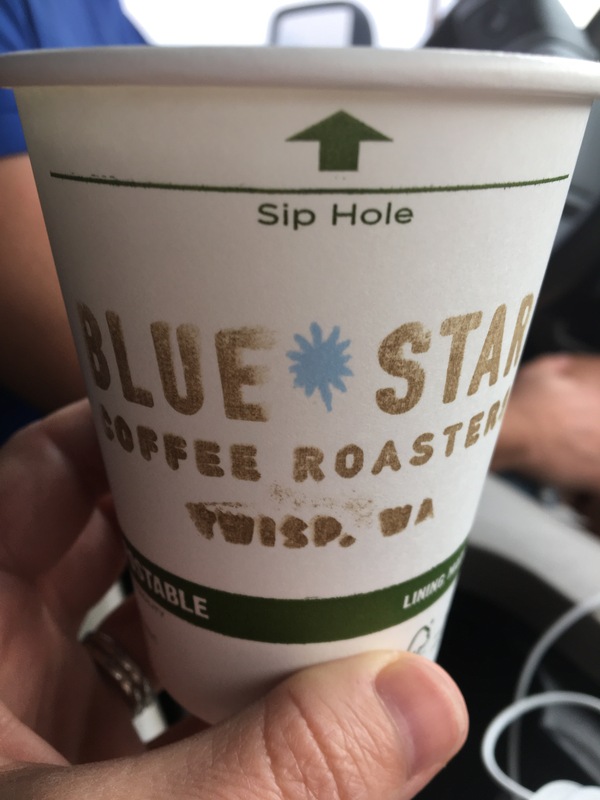 Brad was super excited to stop by his favorite coffee roaster in Twisp, Blue Star. Simply enjoy through the sip hole. 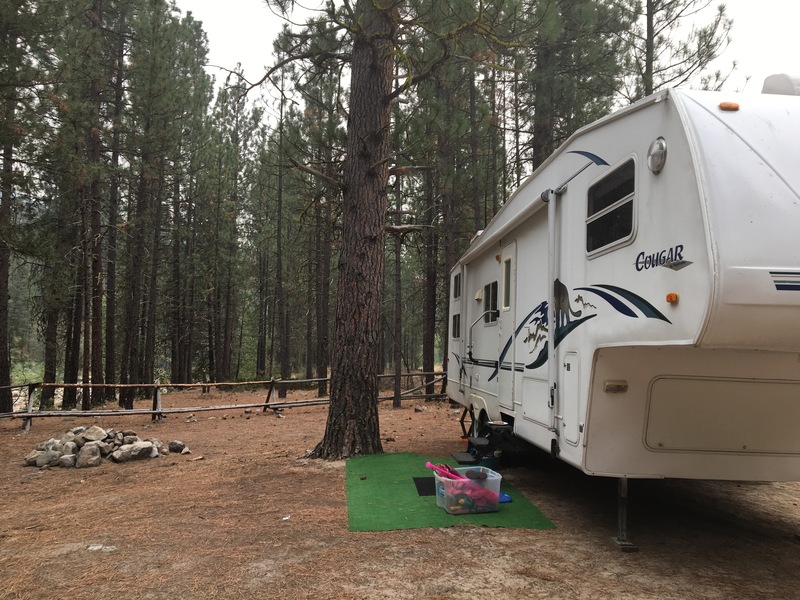 We stayed at another campground owned by Washington State where we could camp for free with our Discover Pass, but this one could not have been more different that the campground outside of Spokane. The Spokane campground was crowded, suburban, and developed with paved roads, water spigots, and a bathroom. This campground was a long wide dirt road along a river where groups of hunters camp during hunting season. There were no facilities of any kind, just signage indicating that our Discover Pass allowed us to camp there for up to 14 nights. We found a cozy little “site” which just meant a worn dirt area with evidence of previous camps fires, next to a lovely little stream. Not bad for free. We thought we might make ourselves comfortable for awhile. We were super excited about this sweet campsite that was free with our Discover Pass. 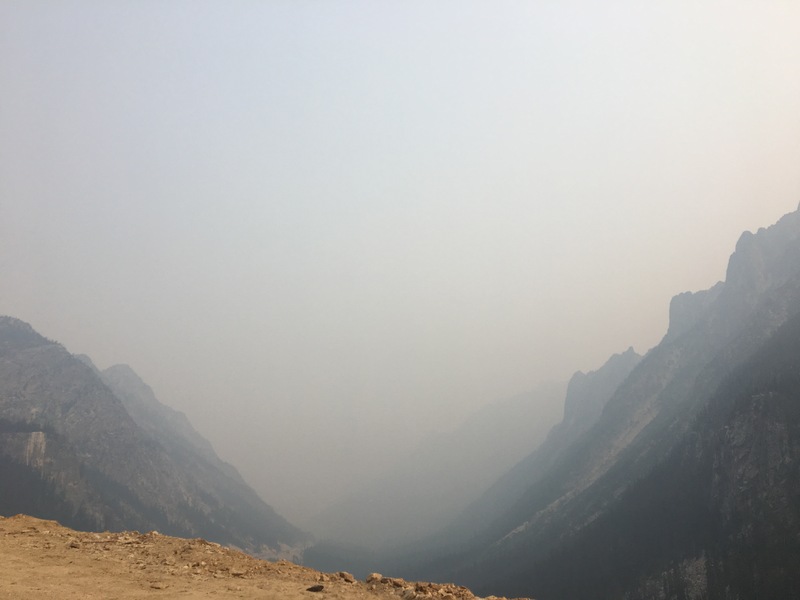 But our whole plan for exploring this area quickly came to the mercy of the wildfires…very large wildfires burning throughout the state were filling the sky with alarming levels of smoke. Smokey skies do make for some eerily beautiful sunsets. The thickening smoke in the air and the large “Fire Information” signs in business parking lots with huddles of concerned citizens circled around made us wonder if the wildfires were closer that we’d thought. I peeked at one wildfire map that made it look very much like the wildfires could be on their way down the river valley that we were camping in. Feeling pretty alarmed by the idea of going to sleep in a remote valley without anyone knowing we were there with encroaching wildfires, we were all but ready to pull up the stakes on our pristine site and head west of the mountains. But a short stop at a ranger station put our mind at ease. 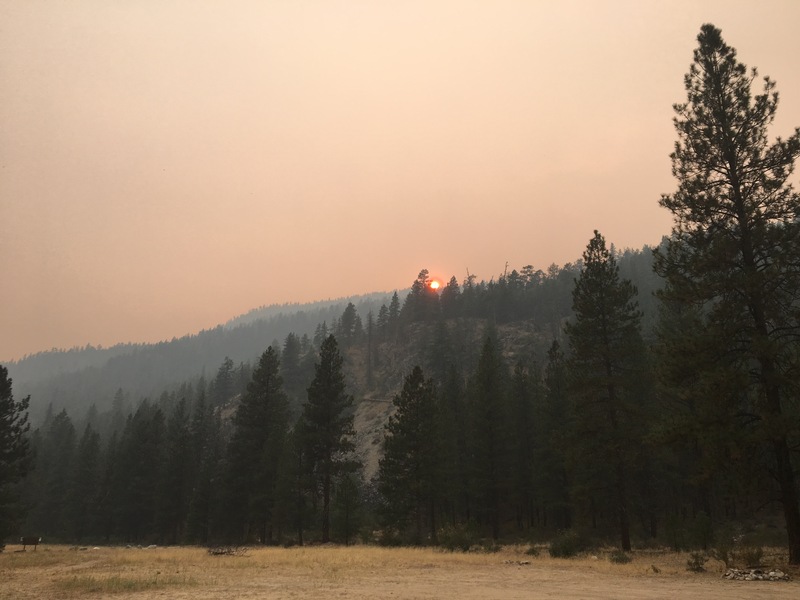 The fires had been in the valley where we were camping the week before, and the camping areas had since been deemed safe and reopened. Even though the “fire line” was very close to our site, the actual fire was more than 10 miles away and headed in the other direction. They also assured us that there were numerous dispersed camping sites along the river, and if the boundary line was pushed toward the river again, firefighters would be knocking on the door of every camper in those areas. Relieved that we were not in danger, we stayed in the area for about 3 nights. 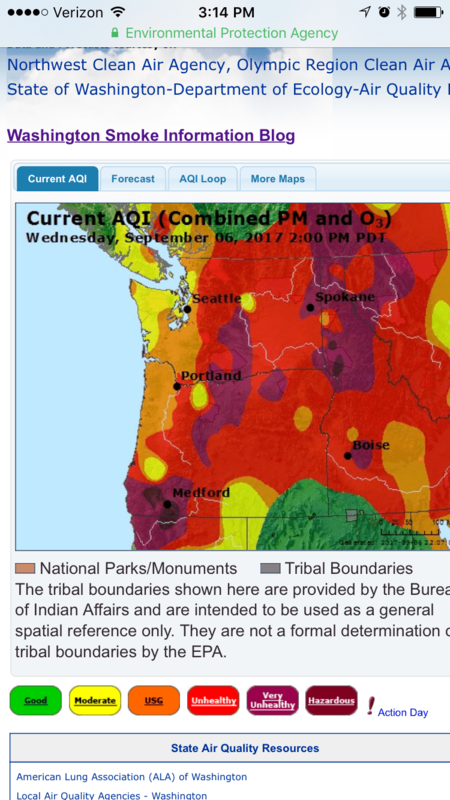 However, we did pull up stakes earlier than anticipated because the smoke made it very difficult to enjoy this beautiful part of the state. 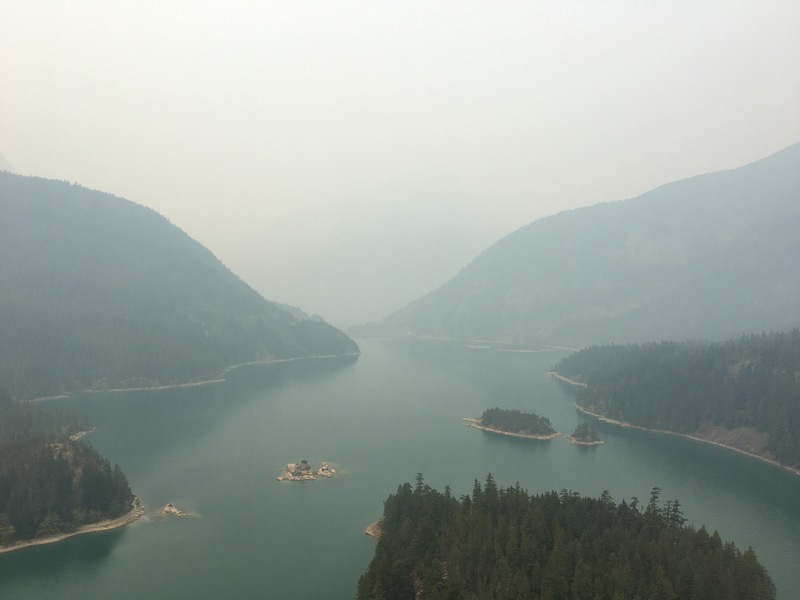 Instead of camping near Diablo Lake, as it was also covered in smoke, we decided to just drive the North Cascades Highway and get over to the west side of the mountains. Finally…we would get to drive this gorgeous stretch of highway known for its amazing views and beautiful lakes. Our experience was a little different from what we had always imagined…. The pristine wilderness of North Cascades National Park. This isn’t what Diablo Lake usually looks like on instagram. Hopefully we’ll have a chance to see it under different conditions eventually!